This refurbished amp saves you some money, and it comes complete with a two-year factory warranty. This factory refurbished version of Russound's D1650 amplifier saves you some money, and it comes complete with a two-year factory warranty. This amp offers versatile multi-room flexibility and plenty of power when and where you need it. Enjoy clear stereo sound in eight rooms, or combine two channels into one to give your speakers more juice — a great option for power-hungry outdoor speakers. The D1650 uses a high-efficiency Class D amplifier design for cool operation, reduced weight, and clean, undistorted sound even at high listening volumes. 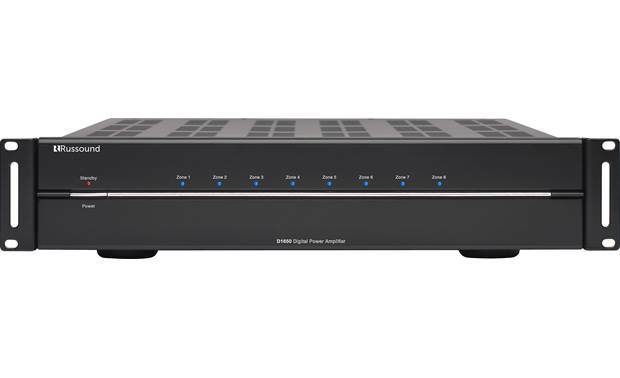 The D1650 can distribute music from one audio source, such as a networked music streamer, to multiple rooms in your home. Or you can connect up to eight separate sources and play a different one in each listening room. Each of the amplifier's playback "zones" features independent left- and right-channel gain controls so you can adjust its output to fine-tune the levels of each speaker in your system. For music playback in more than eight rooms, you can daisy-chain multiple Russound amplifiers together. 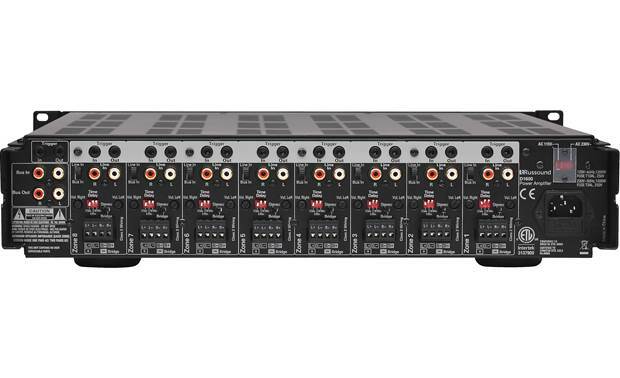 16-Channel/8-Zone Amplifier: The Russound D1650 digital multichannel amplifier offers the features custom installation professionals demand while offering a lighter weight, smaller chassis and more efficient Class D power. The feature-rich design of the D1650 is ideal for the demands of distributed audio systems and is also compatible with our Russound volume controls. The D1650's sixteen channels are arranged in stereo pairs to provide discreet amplification and custom configurations for each of eight zones. 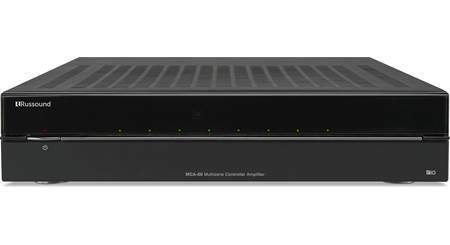 System Configuration: The Russound D1650 can be configured as the main amplifier for an audio distribution system or home theater system. Home Theater Application: The D-Series amp is even up to the rigorous demands of home theater applications, easily transforming into a powerful 160 watt x 8 channel amplifier (in bridged mode). You can also choose to individually un-bridge pairs for lower power applications such as Dolby Atmos or surround speakers. As an example, you could run a Dolby Atmos 7.1.2 system at 7 channels @ 160W and 2 channels @ 50W. Or, the remaining zone can be used for powering an additional area such as an outdoor zone. Speaker Outputs: The Russound D1650 multichannel amplifier is fitted with phoenix-style speaker connectors. The minimum speaker impedance is 4Ω for Stereo Mode and 8Ω for Bridge Mode. Zone Indicator LEDs: The eight LEDs on the unit's front-panel correspond to the D1650's eight stereo zone amplifiers. The LEDs will illuminate blue when the amplifier power is on and a zone is active. The LEDs do not illuminate when a zone is off. Optional Volume Controls: The D1650 amplifier has been tested to work with all Russound autoformer-based volume controls (sold separately).